SAN DIEGO - San Diego-based political podcast Flip the Script: The Future is Female is proud to announce Paola Martinez-Montes, Director of San Diego Alliance of Californians for Community Empowerment (ACCE), will receive the “Truth to Power” award at the much-anticipated 2nd Annual Women Who Change the Game Awards Celebration in San Diego in November. Martinez-Montes is the daughter of immigrant parents, having arrived in San Diego in 1995 from Mexico with her family. Her undocumented status gave her a unique worldview and understanding of injustice, and during her time as a student at San Diego City College she organized around ending budget cuts, increased tuition costs, violence against women, and immigrant rights. She has run civic engagement programs, facilitated community-led campaigns, developed local community leaders and staff, and participated and led policy coalitions aimed at improving the lives of low-to-moderate income families over the past 6 years at San Diego ACCE, and currently serves as the Chair of the Human Relations Commission in the city of Chula Vista. "Paola is an exemplary leader who is deeply rooted in community and stands tall for justice and equity,” said podcast and event co-host Ismahan Abdullahi. 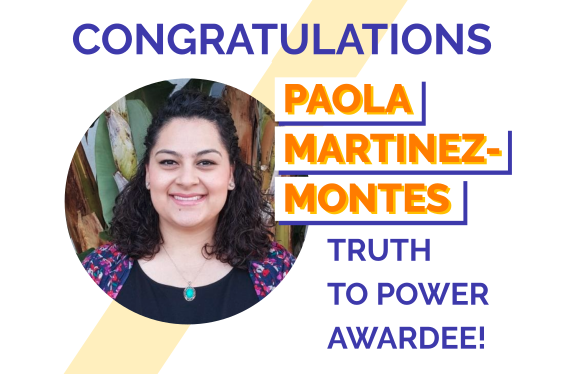 “As a brilliant and powerful chingona in the frontlines of the housing crisis, Paola never shies away from speaking truth to power." Abdullahi continued, “As Director of the San Diego chapter of ACCE, Paola has led the housing fight ferociously and unapologetically, working on repealing the Costa–Hawkins Rental Housing Act and improving the lives of low-income families and communities of color. Paola is flipping the script every day." Including Martinez-Montes, the event will honor three women who have shown outstanding progressive leadership in San Diego: those who have taken action, spoken up and successfully fought for key progressive issues. The featured guest at the event will be the groundbreaking Olympic medalist, author and entrepreneur Ibtihaj Muhammad.